#6 Blue Spade Terminal Vinyl Insulated (16-14) TMR STBS6 Bag of 100. 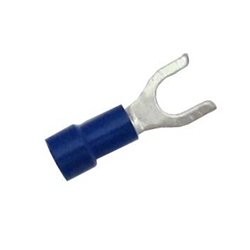 Heat shrink insulated spade terminals, also called fork terminals, are perfect for marine and automotive use. The terminal design allows for easy connection and removal from screw-type connections. Heat shrink is adhesive-lined and color-coded to the industry standard wire range. The terminal will seal out water, and protect the connection from corrosion.